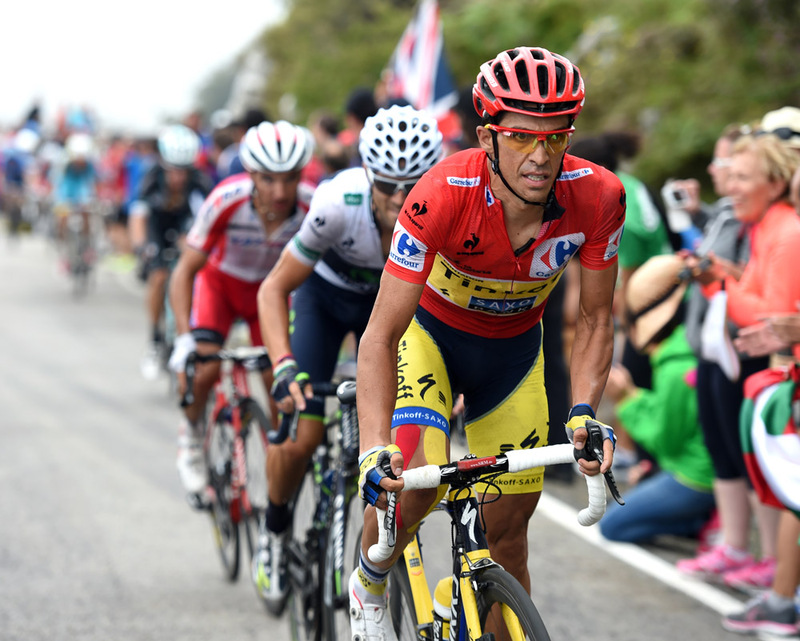 Alberto Contador (Tinkoff-Saxo) will take aim at the Giro d’Italia in 2015 before attempting to win another Tour de France title. The Spaniard from Madrid has won every Grand Tour, including the Vuelta a España this September and the Giro in 2008. “There are still some small details to finalise, but I can tell you that with [Team Manager] Bjarne Riis I’ve planned the Giro d’Italia,” Contador said at a press event near Italy’s Passo Gavia and Mortirolo on Friday. 31-year-old ‘El Pistolero’ from Pinto, near Madrid, won the Vuelta a España for a third time (2008, 2012, 2014) two weeks ago ahead of Chris Froome (Sky). He also counts two Tour de France titles (2007 and 2009) and the 2008 Giro d’Italia. A doping suspension stemming from the 2010 Tour de France, took away his 2010 Tour and 2011 Giro wins. He announced his decision to race the Giro from May 9 to 31 at a sponsor’s event in Valtellina, home of some of Italy’s big mountain passes. On Saturday and Sunday, he joins 1500 cyclists for a sportive ride over the Gavia and Mortirolo climbs. Those climbs could be training for the 2015 Giro d’Italia as they are rumoured to feature in the 16th stage, on May 26. Giro d’Italia organiser RCS Sport will announce its 2015 ‘Corsa Rosa’ on Monday, October 6, but some details have leaked via the media. After a start in Italy’s northwestern costal region of Liguria, the race is due to travel south along the west coast and back up the east coast. RCS Sport confirmed a finish on the Madonna di Campiglio climb in the third week that should also include the Colle delle Finestre and a Sestriere summit finish stage, and the race’s conclusion in Milan. Contador came back from his suspension to win the Vuelta a España in 2012 and returned to his home tour again this year after abandoning the Tour de France on July 14 with a broken right tibia. The 2015 Giro d’Italia and Tour de France would give him a chance to underline his status as the best grand tour cyclist currently racing. He also confirmed that “if everything goes smoothly throughout the season” he will participate in the Tour de France, “since it is the most important race on the calendar.” He reportedly wants to return after abandoning this year to take on Froome and 2014 winner Vincenzo Nibali (Astana), and win his first Tour title since his ban.